Test Scores and the Pressures to Cheat; Rehearsed “Tricks”; Speak in Plain English! ; High Stakes vs. No Stakes; Test Scores on the Rise? ; Too Much Testing? ; Absurdities; Gifted Students: An Elite Society? ; All Hands On Deck; Dog and Pony Shows; Classroom Teacher Responsibilities: You Won’t Believe the List! ; How Many Plates Can You Balance? ; Principals… Just Be Honest; and much more! 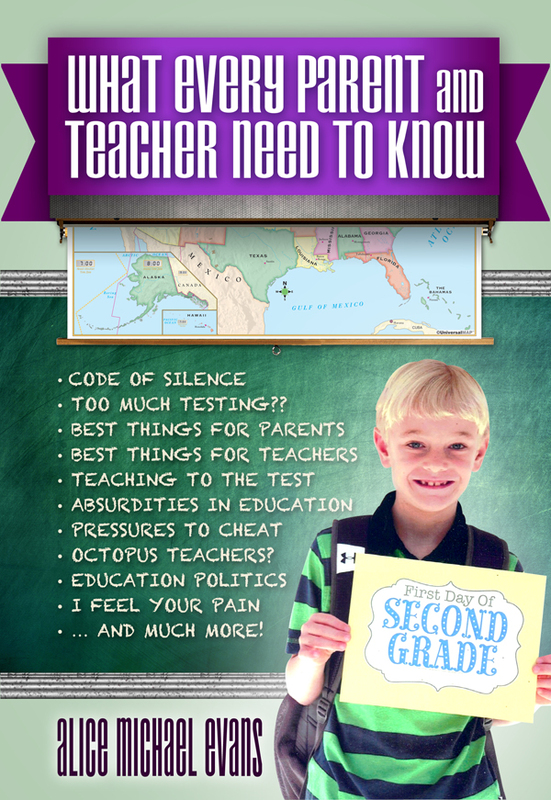 EVERY parent and teacher needs to seriously contemplate these topics. Getting it all out on the table is the key to working collaboratively to make necessary changes for a better educational system! The author confirms that parents have an “inalienable” right and obligation to have tunnel vision when it comes to their child and his/her needs, but hopes the book will convey to them the importance of looking to the left and right to better understand the whole complex picture. With her writing, she intends to enlighten parents, humor them at times, and provide a more informed perspective. Knowing that parents often feel as if they are standing on the other side of a very tall fence separating them from their child’s teacher, the author’s commentary serves as a means to lower the fence, empower both teachers and parents, and be an advocate for our precious children. As the parent of a severely disabled child and a “gifted one”, she has felt the same insecurities and fears, and can certainly relate to the challenges parents face! Although Alice Evans is a staunch supporter of her fellow classroom teachers and feels their joys and sorrows, she makes it clear that she is not necessarily voicing the opinions of all professionals! She is, however, optimistic that teachers will relate to some of her commentary and then feel empowered to speak out more! You can purchase the book online from Amazon or Smashwords in multiple eBook formats at https://www.smashwords.com/books/view/417788.